François Auguste Ferdinand Mariette (February 11, 1821 – January 19, 1881) was a French scholar and archaeologist, one of the early pioneers of Egyptology. He became famous for his discoveries at Saqqara, the vast, ancient burial ground in Memphis, capital of Ancient Egypt. There he uncovered the Avenue of the Sphinxes and the Serapeum, an ancient temple and cemetery of the sacred Apis bulls. Although originally sent to Egypt under the auspices of the French government, and thus obliged to send his findings to France for display in the Louvre, Mariette believed that the findings should remain in Egypt. He accepted a permanent position in Egypt and spent the rest of his life there, securing a monopoly on excavation. He founded of the Egyptian Museum in Cairo, which became the foremost repository of Egyptian antiquities. Mariette's work was significant in opening the field of Egyptology, bringing knowledge of this dominant, somewhat mysterious, early civilization to the West, while at the same time advocating for the right of the Egyptian nation to retain ownership of its own historical artifacts. François Auguste Ferdinand Mariette was born at Boulogne-sur-Mer, France, where his father was a town clerk. His first exposure to Egypt came in 1827, when he was only six years old. At the age of 12 he was already able to read ancient Egyptian hieroglyphs and decipher Coptic writings. When his cousin Nestor L'Hote, the friend and fellow-traveler of Champollion died, the task of sorting his papers filled Mariette with a passion for Egyptology. His 1847 analytic catalogue of the Egyptian Gallery of the Boulogne Museum led to a minor appointment at the Louvre Museum in 1849. He supplemented his salary as a teacher at Douai by giving private lessons and writing on historical and archaeological subjects for local periodicals. In 1849, the Louvre sent Mariette to Egypt to acquire Coptic, Ethiopic, and Syriac manuscripts to add to their collection. The acquisition of Egyptian artifacts by national and private collections was then a competitive endeavor, the English being able to pay higher prices. Mariette arrived in Egypt in 1850. After little success in acquiring manuscripts due to his inexperience, in order to avoid an embarrassing return empty-handed to France and wasting what might be his only trip to Egypt, Mariette visited temples and befriended a Bedouin friend, who led him to Saqqara. The site initially looked deserted, with nothing worthy of exploration. 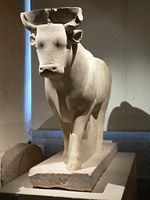 However, after noticing a sphinx, he decided to explore the place, eventually leading to the discovery of the ruins of the Serapeum—the cemetery of the sacred Apis bulls. In 1851, he made his celebrated discovery, uncovering the Avenue of the Sphinxes and eventually the subterranean tomb-temple complex of catacombs with their spectacular sarcophagi of the Apis bulls. Breaking through the rubble at the tomb entrance on November 12, he entered the complex, finding thousands of statues, bronze tablets, other treasures, and one intact sarcophagus. In the sarcophagus was the only remaining mummy, survived intact to the present day. Accused of theft and destruction by rival diggers and by the Egyptian authorities, Mariette had to rebury his finds in the desert to keep them from these competitors. He remained in Egypt for four years, excavating, discovering, and dispatching archaeological treasures to the Louvre, as was the accepted system in his day. Returning to France, Mariette became dissatisfied with a purely academic role after his discoveries at Saqqara. Less than a year later he returned to Egypt. He was supported by the Egyptian government under Muhammad Ali and his successor Ismail Pasha, who in 1858 created a position for him as the conservator of Egyptian monuments. clear the sands around the Great Sphinx of Giza down to the bare rock, and in the process discovered the famous granite and alabaster monument, the "Temple of the Sphinx." 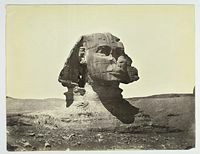 The Great Sphinx in 1867. Note its unrestored original condition with partially buried body. In 1860, he set up 35 new dig sites, whilst attempting to conserve already-dug sites. His success was aided by the fact that no rivals were permitted to dig in Egypt, a fact that the British (who had previously had the majority of Egyptologists active in the country) and Germans (who were politically allied with the country's Ottoman rulers) protested at this "sweetheart deal" between Egypt and France. Nor were Mariette's relations with the Khedive always stable. The Khedive, like many potentates, assumed all discoveries ranked as treasure and that what went to the museum in Cairo went only at his pleasure. Even early on, in February 1859, Mariette dashed to Thebes to confiscate a large amount of antiquities from the nearby tomb of Queen Aotep that were to have been sent to the Khedive. 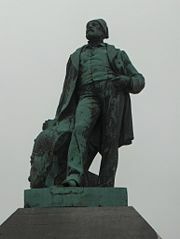 In 1867, he returned to France to oversee the ancient Egyptian stand at the World's Fair Exposition Universelle, held in Paris. He was welcomed as a hero for keeping France pre-eminent in Egyptology. In 1869, at the request of the Khedive, Mariette wrote a brief plot for an opera, which was later revised into the scenario by Camille du Locle. The plot was later developed by Giuseppe Verdi, who adopted it as a subject for his opera Aida. For this production, Mariette and du Locle oversaw the scenery and costumes, which were intended to be inspired by the art of ancient Egypt. Aida was to be premièred to mark the opening of the Suez Canal, but was delayed until 1871. Intended for January of that year, the Cairo premiere was delayed again by the siege of Paris at the height of the Franco-Prussian War. It was finally performed in Cairo, on December 24, 1871. Mariette was raised to the rank of pasha, and European honors and orders were showered on him. In 1878, the Cairo museum was ravaged by floods, destroying most of Mariette's notes and drawings. Just before his death, prematurely aged and nearly blind, Mariette realized that he would not live much longer so he decided to appoint his own replacement in the Museum of Cairo. To ensure France retained supremacy in Egyptology, he chose the Frenchman Gaston Maspero, rather than an Englishman. Mariette died in Cairo in January 1881, and was interred in a sarcophagus. Mariette had never published as much as many noted scholars, and many of his notes and drawings were destroyed by flood. Nevertheless, he is remembered as one of the most renowned and well-known archaeologists. He believed that Egyptians should be able to keep their own antiquities, and founded the Museum of Cairo, which hosts one of the biggest collections of ancient Egyptian artifacts in the world. Brochet, Pierre, Béatrice Seguin, Elisabeth David, & Claudine Le Tourneur d'Ison. 2004. Mariette en Egypte, ou, La métamorphose des ruines. Boulogne-sur-Mer: Bibliothèque municipale. Poiret, Françoise C. 1998. François Auguste Mariette: Champion de l'Egypte. Boulogne-sur-Mer: Le Musée. Ridley, Ronald T. 1984. Auguste Mariette: One hundred years after. Leiden: Brill. Ziegler, Christiane, and Marc Desti. 2004. Des dieux, des tombeaux, un savant: en Egypte, sur les pas de Mariette pacha. Paris: Somogy. Apis Bulls – Account of Mariette's discovery of Apis bulls. Serapeum – Article on Mariette and the Serapeum at Saqqara. The Cemetery of the Sacred Bulls – Excerpt from Mariette’s The Monuments of Upper Egypt.